A UNESCO World Heritage Site, Piazza Duomo is both a jewel of the Sicilian baroque and the vibrant heart of Catania. 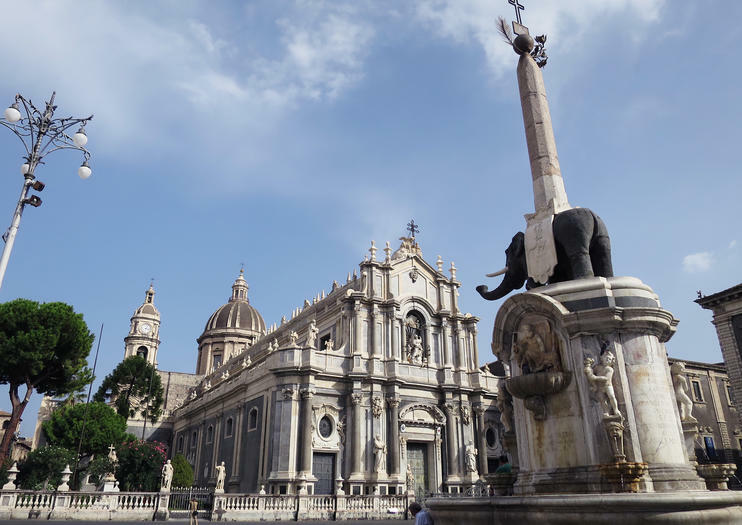 Home to some of the city’s most sumptuous architectural treasures, including Palazzo degli Elefanti, the Cathedral di Sant’Agata (Duomo), and the Fontana dell’Elefante, this square is a highlight of Catania city tours. A showpiece of contrasting white limestone and black lava stone designed by architect Giovanni Battista Vaccarini, Piazza Duomo is the jumping-off point for many walking and Segway tours of Catania’s historic center. Join a private or small-group Catania tour to visit the square along with other top attractions such as Castello Ursino and Monastero dei Benedettini. A must-see in Catania, the piazza is home to some of the city’s top attractions. The monumental Fontana dell'Elefante is surrounded by the ornate Palazzo Degli Elefanti, which now houses city hall. The palatial Cathedral of Sant’Agata has a marble facade incorporating two rows of pilfered Roman columns. Also here are the elegant Bishop’s Palace and the arched walkway of Porta Uzeda. Vast, pedestrian-only Piazza Duomo is a welcome break from traffic for families with young kids. If you’re joining a walking tour of Catania, wear comfortable shoes and a sun hat. Piazza Duomo is well paved and easy to navigate with a wheelchair or stroller. As Catania’s main square, Piazza Duomo often hosts concerts and other special events. Piazza Duomo is located in the heart of Catania’s historic city center, an easy walk from the Catania Centrale train station. Like all Sicilian cities, Catania can be uncomfortably hot in the summer months, and Piazza Duomo offers no shade. Try to visit in the early morning or late afternoon to avoid the midday heat, or plan to tour the city in spring or fall. Piazza Duomo’s star attraction is Vaccarini’s monumental Fontana dell'Elefante, built in 1736. At the the center of the square, the fountain is crowned by the city’s emblem: a statue of an elephant carrying an obelisk. Local lore holds that the elephant belonged to the 8th-century magician Heliodorus, said to have been able to turn people into animals, and that the obelisk magically keeps Mount Etna's volcano in check. The second fountain in the square, the Amenano fountain, was built by Neapolitan sculptor Tito Angelini in the 19th century to memorialize the ancient Amenano River, on whose banks the Greeks first founded the city of Catania. Taste your way through the bustling markets and piazzas of Catania on a mouth-watering, half-day culinary tour. Visit fish markets, bakeries, bars and stalls to sample the best Sicilian street food with a local guide. Try regional specialties like ‘arancini’ (stuffed fried rice balls), fizzy drinks, ‘cipollata’ (bacon-wrapped onions), ‘zibibbio’ wine and decadent cannoli. Learn what makes Sicilian cuisine unique from the rest of Italy while discovering some of Catania’s cultural treasures. This tour makes it easier than ever to get up close and personal with Mt. Etna: Europe’s highest active volcano, and one of Sicily’s most visible landmarks. Journey to Rifugio Sapienza, at Etna’s base, before your trek; all equipment is included, and an add-on journey to its crater is available (own expense). Next, explore the volcano’s lava caves before stopping at an area farm for a sampling of local products. Discover the street food and snacks of Catania on a daytime walking tour around the city. Visit the main piazza, and the elegant Via dei Crociferi or Benedettini enclave, learning about Catania’s food and its place in Sicilian culture as you stroll. Sample treats at market stalls and bakeries, and then leave armed with tips for the best places to eat in town. A food 'passport' is included so you can keep track of your favorite bites along the way. HIGHLIGHTS OF THE TOUR:A classic itinerary through the best of the Mediterranean’s most alluring island. A tour discovering the most remarkable places of the island, listed in the UNESCO World Heritage, exclusive services and high quality hospitality in charming manor houses and hotels, where stop over and relax. HIGHLIGHTS OF THE TOUR:Experience the authentic Sicily, a unique fusion of Mediterranean cultures. A tour that reveals the treasures of the most beautiful Mediterranean islands, listed in the UNESCO World Heritage. A tour where art, history, traditions as well as smells and tastes wisely melt together to present an unforgettable stay. A fantastic tour to enjoy the beauties of Sicily, stunning art, history, archeology, stunning beachs and delicious food.The tour starts / ends from Catania; we visit this beautiful towns rich of attractions and from here every day we move on to visit:- Mount Etna, the highest active volcano in Europe- the Cyclops Riviera, visiting 2 enchanting fishermans village still intact, the best sea food restaurants are here;- Taormina, the ancient Greek colony, with its pedestrian path full attractions, shops, restaurants, amazing views and more else;- Castelmola, a medieval village perched on the rock above Taormina; with its towering fortress and the picturesque streats;- Giardini Naxos, with its amazing bay and the great coast line;- Savoca, one of the most beautiful Italian villages, location of Coppola's "Godfather" and also for its marvelous ancient monuments;- Catania city: cathedral, fish market, Opera House, Castel and big shopping centers. HIGHLIGHTS OF THE TOUR:Discover the essence of Sicily and its most beautiful and stunning destinations. A route to discover a region full of charme, history and culture, listed in the UNESCO World Heritage. A mythical trip into Greek, Arab-Norman and Baroque world, designed to explore the best that this land has to offer.